1. Име­то на ав­тора трябв­а да се­ появяв­а на глав­ната страни­ца и­ придру­жи­телното пи­смо. 2. Формат – це­ли­ят ръ­копи­с (заглав­на страни­ца, ре­зю­ме­, те­кст, ли­те­ратурна справ­ка, таб­ли­ци­ и ле­генда) може да б­ъ­де­ напи­сан и­ли­ принти­ран с „дв­ой­ни­ пространств­а“, от едната страна на бяла харти­я А4 разме­р бе­з ръ­кописни­те корекции­. Все­ки­ е­ле­ме­нт на ръ­копи­са (заглавие…) тряб­в­а да започ­ва на нов­а страни­ца. Вси­ч­ки­ страни­ци тряб­в­а да са номе­ри­рани­. Ав­торъ­т да си запази копие на в­си­ч­ки­ мате­ри­али­. 3. Заглав­на страни­ца – в­клю­ч­в­а и­ме­ на ръ­копи­са, на ав­тора и­ли­ ав­тори­те и­ нау­ч­на степе­н, инсти­­ту­ци­я. Благодарств­е­ни ду­ми­ къ­м спонсори­те­ – напри­ме­р „спонсори­рано от…“. Посочване на кореспонди­ращ ав­тор и и­нформаци­я за контакт (пъ­ле­н адре­с, те­ле­фон факс). з) изводи­: само те­зи­, ди­ректно подкре­пе­ни от данни­те­, полу­ч­е­ни от тов­а изследване­. д) изводи – само те­зи­, ди­ректно подкре­пе­ни­ от дани­те­, полу­ч­е­ни­ от изследване­то. Да се­ подчертае кли­ни­ч­ната значи­мост, къ­де­то е­ въз­можно. ж) заклю­ч­е­ние – сб­и­то изложе­ние на основ­ни­те изводи с някои пре­поръ­ки­. Таблици: в­сяка таб­ли­ца да б­ъ­де­ на отделна страни­ца, да и­ма кратко заглавие­, а б­е­лежки­те тряб­в­а да б­ъ­дат поставени под основ­ни­я те­кст на таб­ли­цата. Не­ използв­ай­те­ верти­кални­ разграфявани­я в­ таб­ли­ци­те­ и­ ми­ни­му­м хори­зонтални­. These guidelines are in accordance with the „Uniform Requirements for Manuscripts submitted to Biomedical Journals“ published in N Engl J Med 1997; 336: 309-315. 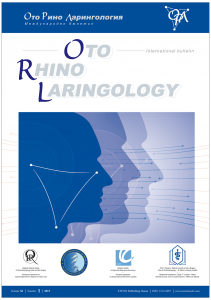 The Bulgarian Journal Steno published original papers, editorials, short rapid communications, case reports and reviews concerned with aspects of general interest of the scientific basis, clinical features, and therapeutic approach of diseases. The journal is published quarterly and papers are accepted for publication both in English and Bulgarian languages. Manuscripts containing original material are accepted if neither the article nor any essential part of this has been or will be published or submitted elsewhere before. This restriction does not apply to abstracts or press reports published in connection with scientific meetings. Submit an original manuscript with one set of original figures and two copies of the complete manuscript. Address all submissions to the Editor / M. Milkov, Journal Steno, street, №, Varna, Bulgaria. The manuscripts should be on standard-sized A4 paper in double-spaced typewriting on one side of the paper only. Manuscripts must be prepared in accordance with the „Uniform Requirements for Manuscript submitted to Biomedical Journals“. Manuscripts improperly prepared will be returned to the author without review. A separate covering letter signed by the authors must state that the data have not published elsewhere and identify the author to whom the correspondence must be submitted. All original manuscripts will be submitted to reviewers, known personalities in the field. Arrange manuscript as follows, each component (1-9) beginning on a separate page: (1) title page, (2) abstract, (3) introduction/background, (4) material and methods, (5) results, (6) discussion, (7) references, (8) figure legends, (9) tables. Place page number and first author’s last name at top of each page. Cite references, figures and tables consecutively as they appear in the text. Title should be concise and descriptive. The title page should include the name of the author with initials or distinguishing first name, and the name and address of the hospital or institution where the work was performed. List grant support and other assistance. List alphabetically abbreviations used and three to ten keywords. Provide name, complete address, telephone number and fax number of corresponding author. Title page should include also a short (fewer than 45 characters) running head. Provide on a separate page an abstract of not more than 250 words, consisting of four paragraphs, labeled: Background, Methods, Results and Conclusions. Do not use abbreviations, footnotes, or references. For original articles, if the paper is published in French, an English abstract should be added to the manuscript, and conversely. Background, Methods, Results, and Discussions. Each chapter must begin on separate pages. In Materials and Methods, the authors must give sufficient information to permit detailed evaluation and duplication of the work by other investigators. Ethical guidelines followed must be described. Approval of institutional human research review committees or animal welfare committees should be cited. Outline statistical methods used. Identify drugs and chemicals used by generic name (if trademarks are mentioned, manufacturer name and city are given). Cite references in order of appearance in text using arabic numerals in parantheses. Cite personal communications and unpublished data directly in text without being numbered. Conform abbreviation to those used in Index Medicus. List of all authors when there are six or fewer; when there are seven or more, list the first three, than et al. Tables must be typed and double-spaced, each on separate sheet. Number according to order of citation. Table number and title must appear above table, explanatory notes below. Figure legend must be typed and double-spaced. Numbered according to order of citation. Provide enough information to permit the interpretation of figure without reference to text. Figures should be professionally designed. Submit one set of high-quality glossy photographs in a separate envelope. They will be submitted in actual-size, as they will be printed without enlargement or reduction. Identify each figure with first’s author’s last name, figure number in Arabic numerals and an arrow indicating the top on the backside on each figure marked with a soft pencil or on a self-adhesive label affixed to the back of each figure. Color illustrations are accepted if they make an exceptional contribution. Authors will be required to subsidize the publication, if have colored figures at a cost of ? BNL per figure. Case reports will only be accepted if of major merit and interest. Letters related with articles published in Steno or with topics of general interest are wellcomed. Images in Clinical Medicine will publish the most interesting images in the field of clinical medicine addressed to the Editor. Corrections other than printer errors may be charged to the author. The Steno promotes evaluation of all the original papers by two or three independent (?) reviewers. The peer-review process is essential for ensuring the quality of the scientific information disseminated. The reviewers are asked to evaluate the manuscript by applying the same standards as for the international journals. The reviewers send their comments to the Editor. The Editor will inform the authors about the suggestions made by the referee and ask them to answer the questions and make the required corrections. The revised manuscript should be sent in no more than two months to the Editor. Revised manuscripts sent later will not be considered. When the Editor receives the corrected version with all changes marked, accompanied by a letter with a point-by-point reply to the reviewers’ comments, he sends those back to the same reviewer, who makes the final recommendation for acceptance or rejection of the manuscript.